An increasing proportion of the hundreds of millions of PET glasses and soft drink bottles in circulation annually are recycled, which is fortunate, because this is the basis for the success of PET360®. Until now, PET glasses were produced with about 40 percent recycled PET (rPET) and 60 percent virgin PET. The use of PET360® means that it is now possible to produce disposable glasses from 100 percent post-consumer PET waste (bottles and glasses), making the PET360® thermoforming process 100% cradle to cradle. The method produces practically the same quality as PET glasses made with virgin raw materials. 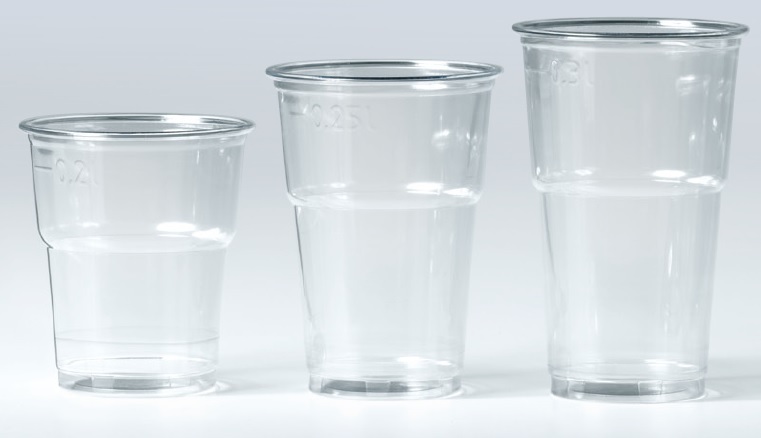 From now on, it really is possible: Plastic beer glasses that can be completely, i.e. 100%, recycled for new PET glasses after use. Strong, light-weight, easily stackable and surprisingly transparent without having to add virgin A-PET material and without the raw material losing its value. Even cuttings can be used again so that nothing is lost in the production process. And, of course, all the participants in the chain meet the usual quality standards. More and more companies and events will commit themselves to 100 percent recyclable plastic packaging within the next few years and Bordex Packaging already has the solution for plastic glasses. PET360® ensures transparency within the entire chain. The PET360® series will be added step by step to our range of PET glasses in the next few months. Event management organisations are also looking for the ultimate form of event management Dealing with waste in the right way is becoming a more important part of event culture. PET360® glasses, produced from 100 percent food-safe recycled PET, are the ultimate solution. The One Project is the 360° platform for this. The One Project is a consortium in which several partners in the circular chain have found the perfect sustainable solution. The platform not only supplies the glasses but it takes care of everything for you in five traceable and completely certifiable steps. A closed 360° eco-system met 0 percent waste! PET360® glasses are collected in a creative way after use. The aim: 100 percent collection. Every used glass is returned. The glasses are grouped per event and pressed into bales. The amount per customer/event is collected, washed, sorted and granulated. The event organisation can find out the exact amount of collected PET per event by means of the waste tracking system. The granulated PET is then used for the production of glasses required for next year’s event. 100 percent post-consumer PET is converted this way into new, high-quality PET glasses.